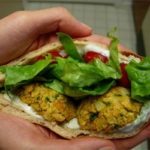 "This is a tasty dense falafel that contains no eggs. Serve on pitas with tzatziki or tahini sauce with lettuce and tomato." PREP 25 mins COOK 7 mins READY IN 32 mins Directions Mash the garbanzo beans in a large bowl. Stir in the onion, garlic, cilantro, parsley, cumin, turmeric, baking powder, bread crumbs, salt and pepper. Do not be afraid to use your hands. Shape the mixture into 1 1/2 inch balls; you should get 18 to 24. If the mixture does not hold together, add a little water. Heat the oil in a deep fryer to 375 degrees F (190 degrees C). Carefully drop the balls into the hot oil, and fry until brown. If you do not have a deep fryer, heat the oil in a heavy deep skillet over medium-high heat. You may need to adjust the heat slightly after the first couple of falafels, and be sure to turn frequently so they brown evenly.